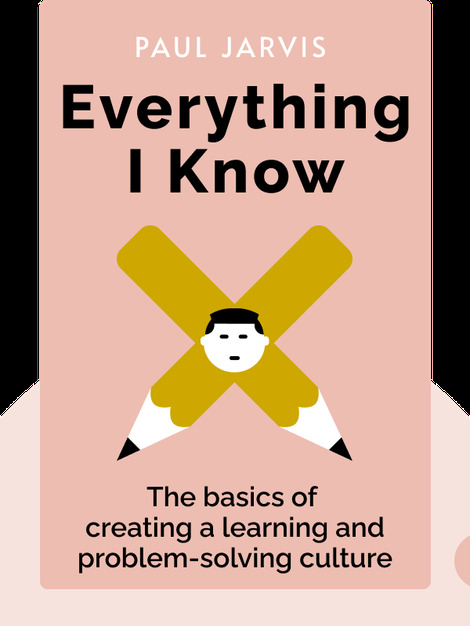 As the title suggests, Everything I Know (2013) is a collection of what author Paul Jarvis knows, after having worked as an in-demand web designer for over 20 years. This is a compendium of insight on how to be a successful, self-employed entrepreneur with a rewarding and lasting business. Paul Jarvis is a sought-after web designer who has worked with Fortune 500 companies and top brands such as Microsoft, Yahoo! and Mercedes-Benz. As well as having founded multiple start-ups, he continues to work as a touring musician with the band Mojave. As a writer, his work has appeared in publications such as GOOD and Fast Company. His self-published books include Write & Sell Your Damn Book and Be Awesome at Online Business.